The Red Sox didn't make a formal offer to Jonathan Papelbon, who reached a four-year, $50MM agreement with the Phillies today. Cherington said he discussed "concepts" of a new contract with Papelbon's agents Sam and Seth Levinson, but didn't make an offer since Papelbon's asking price simply didn't fit into Boston's offseason plans. Cherington said he wasn't given the option of matching the Phillies' offer by Papelbon's representatives, but he didn't think such a step was necessary. Given the number of closing options on the market, Cherington didn't think his team would feel comfortable offering a four-year contract to a closer as the Phillies did with Papelbon. The Red Sox have been talking to David Ortiz's representatives and Cherington said he wants to re-sign the veteran slugger. "Because of what I feel, and I think he feels, is a little bit more of a defined market for that role it's been easier to engage sooner," Cherington said. "It's probably less likely to be a situation where he gets into the market and there's something that he's pushed into a corner on. David knows we want him to be here. 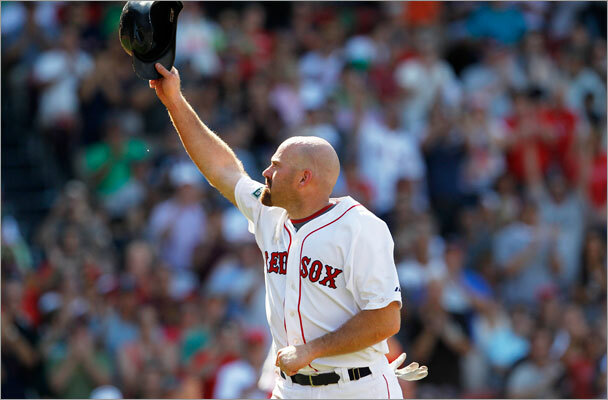 We want him to be back with the Red Sox. We want him in our lineup. We've had a lot of dialogue to see if there's a way to do that and I think that will continue." Cherington feels that beyond the top free agent starters, there is "a lot of risk" in the pitching market this winter. "There are options, but riskier and would require some sort of bounce back from injury or bad luck or performance to some degree," the Boston GM said. "We're going to be exhaustive in looking at ways to build depth to the rotation an the bullpen. We do believe we have some internal options that will help us." How many picks did the sox get for signing carl crawford or bobby jenks ? I got news for you. Phillies a going to get an extra draft pick by signing Papelbon instead of Madson. No they aren’t. They wouldn’t have lost any draft picks for signing Madson. They lose their first round pick for signing Papelbon but they potentially get another team’s first round pick + a supplemental rounder. They are gaining 2 by not signing Madson. You can’t really have a defined plan with these kinds of things because situations are so fluid, especially this early in the off-season. That’s a good thing. GM’s that plan out their dream scenario and hold out for their favorite players for every position end up having to overpay or not having a backup pan. I do like that Cherington is approaching the offseason with caution. He seems to realize that the team only needs minor tweaks rather than an overhaul. I’m looking forward to what he will do. depth to the rotation an the bullpen.your missing a D there. im also missing a period but i wasnt the one correcting the article. it was irony, you know, the opposite of wrinkly. Instead of overpaying Papelbon, they’ll proceed to overpay Ortiz. possibly, but by a whole lot less. I’d rather pay $12 million for an everyday player who will hit 30 HR and dirve in 100 RBI than pay more for a pitcher who will pitch less than 70 innings. First test for Cherington passed: don’t give a ridiculous contract to Papelbon. That $12.5 million can be used for someone who will give 200 innings, not 75. Completely agree. Paps will be greatly missed, but he saved Boston a boatload of money signing elsewhere. Get Grady Sizemore and two bullpen arms after you get Big Papi. Then we’ll call it a done offseason. Who are going to take Lackey’s and DiceK’s turns in the rotation? I think that we might need 2 or 3 starters too. Grady Sizemore won’t help our already lefty lineup. I want two compensation picks for Ortiz. Offer him arbitration, Cheri, and let him walk. We need at least two starters. I suggest that Cheri get busy in figuring out how we are going to round out the rotation. We’ve all been saying it for years: Papelbon will walk when he reaches free agency. Paps has reiterated over and over again that he wants to set the market for closers…and I just thought there was no way Epstein (who knew Epstein would be gone by the time Paps free agency came around) would make that happen. Good job on Cherington’s part!